In the iOSphere, this whole week seems like one long April Fool's Joke. A set of illustrations based on sketches from an anonymous Asian multiplied through the iOSphere at broadband speeds, revealing what the iPhone 6 big-screen models will look like. And another set of iPhone 6 photos, this time of images on a computer screen, achieved a new height, or possibly depth, of meta-ness. Also this week, the iOSphere took hope in unfounded reports that display makers are starting up production of Big Screens for iPhones next month; and in the apparent stupidity or carelessness or both of an Apple display partner who revealed a new higher-resolution screen that must be intended for iPhone 6. And, of course, it's 5.5-inches diagonal. Your read it here second. 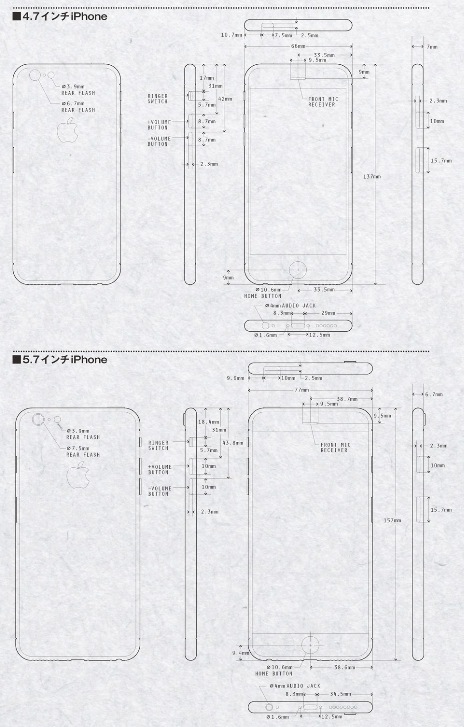 A week ago, schematic drawing purported to be of a 4.7- and a 5.5-inch iPhone 6 were disclosed in the Japanese magazine MacFan, and picked up first by Mac Otakara and then other blogs and tech sites, such as Macrumors. Here's a photo of the schematics. Which are, you know, sketchy. Apparently, too sketchy. NoWhereElse.fr editr Steve Hemmerstoffer asked his friend, Martin Hajek, who's done plenty, to create a series of photo-realistic renderings of the phone based on the schematics. Here's Hemmerstoffer's original French language post. And here it is via Google Translate. "Before anything else, I want to say that I am absolutely not able to ensure the reliability of the source of the alleged leak source with which I had never before been in contact. The greatest caution is called for...," Hemerstoffer helpfully cautioned readers. Now that that's been cleared up. "Now that things are clear and assuming that the illustrations below are true, the iPhone 6 would be declined in two versions (N56 / N61 and 402/401 models) respectively equipped with a screen of 4.7 and 5.5 inches diagonal," he wrote. So, if you get past all the "ifs" -- and this being the iOSphere that's not hard to do -- then you now can see what the Next iPhones will look like. It will be thinner, with rounded edges, and the larger model will be so thin (the so-called "iPhone Air") that the camera module will "protrude" or "bulge" from the body. It would be hard to top the previous item for sheer meta-ness, but the iOSphere outdid itself this week. GForGames posted what it called "leaks," namely photos purportedly of the iPhone. "[T]he latest iPhone 6 leaks claim to show the real thing, or at least a prototype," GForGames revealed, not slowing down a bit to wonder at how large a gap in our understanding the "or" creates. "And if this is legit, it looks like the rumor about the protruding camera was right on the money. Take a look." GFG posted a series of images copied from the original post on the Chinese website Weibo. The latest iPhone 6 leaks claim to show the real thing, or at least a prototype. And if this is legit, it looks like the rumor about the protruding camera was right on the money. Take a look. And if you do, here's what you see. You see the back of a smartphone. But you're seeing it on a computer monitor. The actual image could be a photograph. Or it could another Martin Hajek "rendering." How can anyone know? "Allegedly, the above pics are coming straight from a Foxconn insider, and as you can see, both the live pics and the phone's sketch are indicating that Apple is at least testing a model with a protruding camera." And if you do take a look, here's what you see. You see the back of a smartphone. But you're seeing it on a computer monitor, possibly a laptop screen. Let's think about this. GFG is showing us what claims to be a photograph, of a computer screen, which is displaying another image, which may be a photo or, if Martin Hajek simply had a busy week, another rendering, of what could be the "real thing" or "at least a prototype." GFG seems to overlook the fact that prototypes are real, too. Unless they are, you know, fakes. But despite there being so much less to this than meets the eye, it is, momentarily, a thrill...comparable to realizing the wall you painted has dried. Can you hear it? That electronic hum rising slowly like a choir of angels in an ecstatic exultant hymn to innovation. Yes: it's the Asian assembly lines warming up to begin "mass producing displays as early as May for the next iPhone," according to a Thomson Reuters story. First up they will be turning out the 4.7-inch screen for the first iPhone-to-be-bigger-than-four-inches. But the even bigger 5.5-inch display, "could be delayed." This is all from anonymous "supply chain sources...who asked not to be indentified," according to Reuters. Reuters considers the larger-screen models "yet another incremental tweak...[in] an attempt to catch up to rivals like Samsung Electronics." "Both iPhone 6 screens are expected to use in-cell touch panel technology," Reuters says, which is a conventional prediction. Apple is one of the few smartphone makers using in-cell touch, "which really is a fancy way of saying that the digitizer is then integrated into the LCD-TFT gating itself, and thus into the cells of each pixel, rather than as a discrete layer atop the stack after color filters," according to AnandTech's Brian Klug, in his analysis of the iPhone 5, which was the first Apple phone to make use of it. That integration makes for a thinner screen, with greater light transmission because it reduces internal reflections. Reuters claims that "production of 5.5-inch screens is expected to start several months later, with the possibility of a shift to a film sensor instead of in-cell technology for that size, the source said." Film sensors have been in the rumor mill for a few years, as a lower-cost sensor technology to replace Indium Tin Oxide (ITO). But one of the best known, In-Touch Sensors developed by Unipixel, apparently has only recently moved into large-scale commercial production. 3M announced in January it was ramping up its own touch film production. Although the Reuters story doesn't explore this, the alleged start of display production in May raises questions about whether the display will, or can, make use of the sapphire that Apple may or may not yet be producing at its Mesa, Ariz., facility, which will stock sapphire furnaces from GT Advanced Technologies. The use of sapphire as a cover glass, replacing Corning's Gorilla Glass, will require a whole new set of downstream facilities that can cut, shape, process, and finish the extremely hard sapphire sheets. It's quite unclear whether Apple's supply chain has accomplished this upgrade. One could speculate that the 5.5-inch "delayed" larger display is the one slated for sapphire glass. But any delay, which apparently refers to assuming a September announcement was scheduled, might mean a 5.5-inch iPhone would be announced later in 2014. A number of iOSpherians seem convinced that a Japanese company that is said to be one of several display panel suppliers to Apple has revealed the screen to be used in the iPhone 6. "Is this an iPhone 6 display?" wonders the headline to the Brooke Crothers post at CNET. Japan Display Inc. announced a week ago that it has developed a 5.5-inch wide Quad HD display, with a resolution of 1,440 x 2,560 pixels and a pixel density of 538 pixels per inch, and it's targeted at "leading-edge smartphones," Crothers noted. The previous week, a Tokyo-based business publication said that Japan Display was one of three display suppliers for the Next iPhone. JDI says it will start shipping the 5.5-inch TFT LCD display modules for smartphones in April. Here's JDI's photo of the new screen. And you can find the brief JDI press release in full online. JDI's release also doesn't mention sapphire, as noted above. If this display is being used in the purported larger iPhone model, then it too is unlikely to be making use of sapphire glass. So, to recap, we still don't know what size screens the Next iPhone will have.